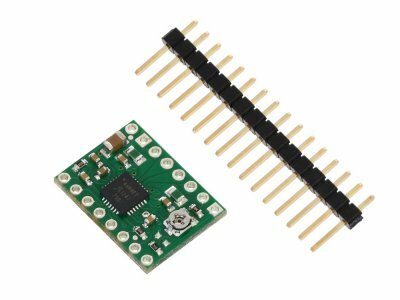 The A4988 stepper motor driver carrier is a breakout board for Allegro’s easy-to-use A4988 microstepping bipolar stepper motor driver. The driver features adjustable current limiting, overcurrent protection, and five different microstep resolutions. It operates from 8 - 35 V and can deliver up to 2 A per coil.